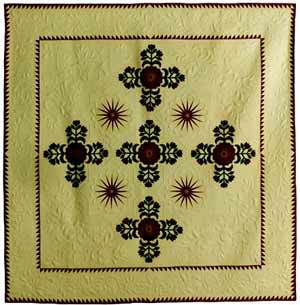 The National Quilting Association�s Show in Peoria, June 23 through June 26, 2004 held many surprises. Whenever I attend a quilt show, I expect lovely quilts, updates on methods, and a peek at new fabrics, books and supplies. The Peoria show had all this and more. The Peoria Civic Center was bursting with exciting new ideas and designs. Winning Quilts: Although all of the award winners cannot be named here, the �Best of Show� in the bed quilt category was �Jubilee� by Linda McCuean, of New Galilee, PA. 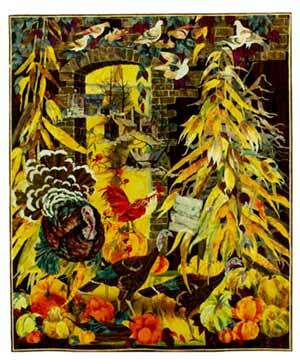 In the wall quilt category, �Letters to Sylvia� by J. Phil Beaver of French Lick, IN., won. 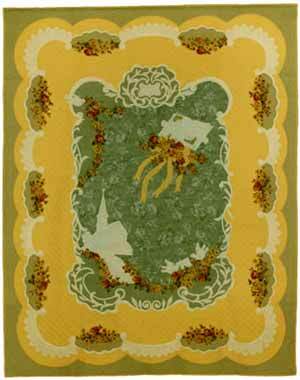 Mildred Sorrells of Macomb, IL, took the award for �Best Hand Quilting� with her �Golden Glow� quilt. And, Linda McCuean also won the �Best Machine Quilting� award with �Jubilee.� These quilts are perfect specimens�they dazzled the viewers and set the bar higher for anyone who wants to achieve perfection in quilting. Special Exhibit: One of the most delightful surprises was Mildred Sorrells and her friend Jean Lohmar�s �Two Woman Show� in the bank building across the street from the Civic Center. They had forty of their prize-winning quilts on display. These two amazing women have been �playing� with design and fabric for 30 years. Mildred�s �Golden Glow� has won not only at the NQA Show, but has been shown at 18 other juried shows. Talking with them was inspiring�they love quilting and the challenges that come with the territory. They improvise. When Jean had trouble piecing tiny pieces, she just mixed up some starch and stiffened the fabric. When Mildred wanted to get perfect corners, she devised a blocking method. They travel the country, searching for just the right fabric. A quilting buddy is a must, and these two are perfectly matched. Meeting them was energizing when my feet thought they were worn out. Get on the Bus! A convenient bus took quilters on a tour of local quilt shops, saving our feet for later. This is a popular trip so we could see what a new part of the country has for sale. One of the surprises was found at the shop in Washington, Illinois, where the John Watts Quilt Frame was demonstrated. 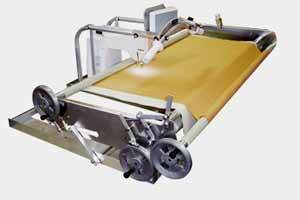 This is a way for you to turn an ordinary sewing machine into a �long-arm.� Coming out of Australia, where it has been very popular, two Australian men taught us how we too could streamline machine quilting. See www.johnwattssewing.com.au for more information. Shop till You Drop! Back at the Civic Center, a variety of vendors were on hand to tempt us with their wares. I love the button jewelry at Prize Possessions, Betty Boyink�s Quilting Books Unlimited kept me occupied for several hours, Sandy McCay�s Cotton in the Cabin booth had indigos and spool chests, and Cindy Rennels displayed her array of fine antique quilts. The vendors� booths had everything from stationery to fabric-covered lampshades, with many quilts and quilting supplies on hand. Preview Party: Another surprise was the well-planned preview party and dinner. On Wednesday night, dinner was served at the Civic Center while slides previewed the winning quilts and reviewed past winners. 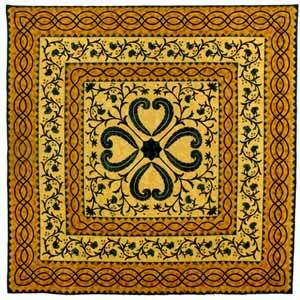 After the meal, we adjourned to the convention floor to see the quilts and shop at the vendors� booths. We had lots of energy to preview the show because our tables were decorated with Hershey�s kisses! Best Of Show Wall Hanging.